With warm summer evenings, it’s nice to have a go-to recipe for an easy-to-prepare, light yet filling, entrée. 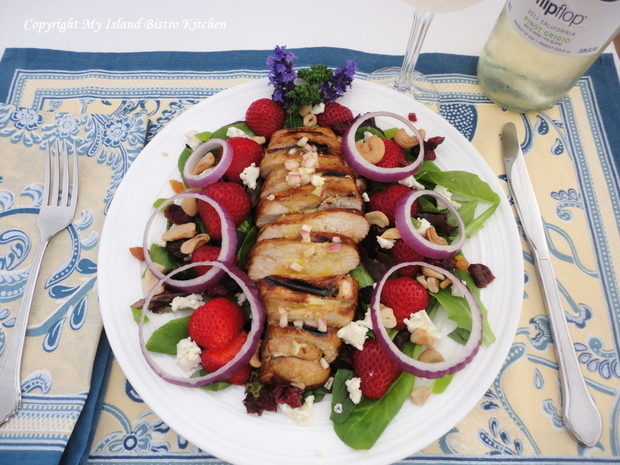 One of my favorite summertime evening meals is warm grilled chicken served over a strawberry, feta cheese, and green salad and drizzled with a good balsamic vinaigrette. 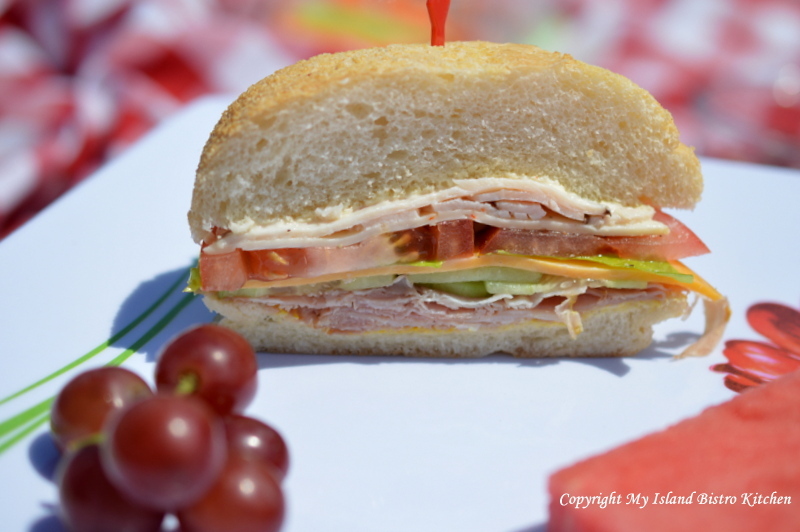 The option is yours to choose to marinade the boneless, skinless chicken breasts or not. I usually do and I don’t follow a precise recipe for the marinade but these are the usual ingredients: brown sugar, olive oil, balsamic vinegar, garlic, minced onion, soya sauce, salt, and pepper. As for quantities of each ingredient, I don’t actually measure them out and add more or less, depending on how many chicken breasts I am marinating. 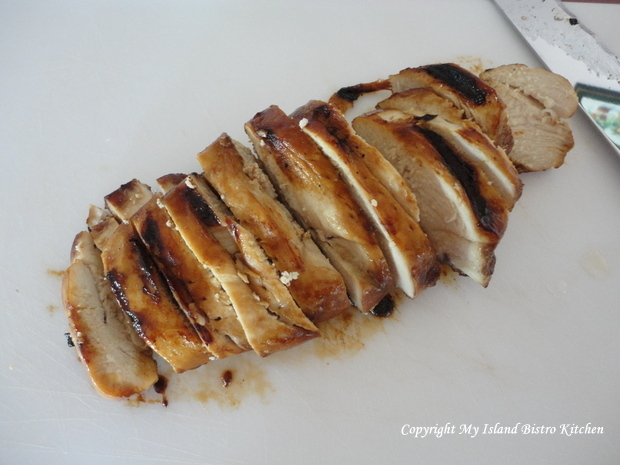 I make several horizontal cuts in the chicken breasts to allow the marinade to permeate through the meat. Place the chicken breasts in a ziplok bag, mix together the marinade and pour it into the bag, making sure the entire chicken breasts are covered. Zip up the bag and place it in the fridge for several hours (I usually aim for between 2 and 4 hours). Heat up the grill and cook the chicken breasts until they are done. One of the pleasures of summer is having our own garden. 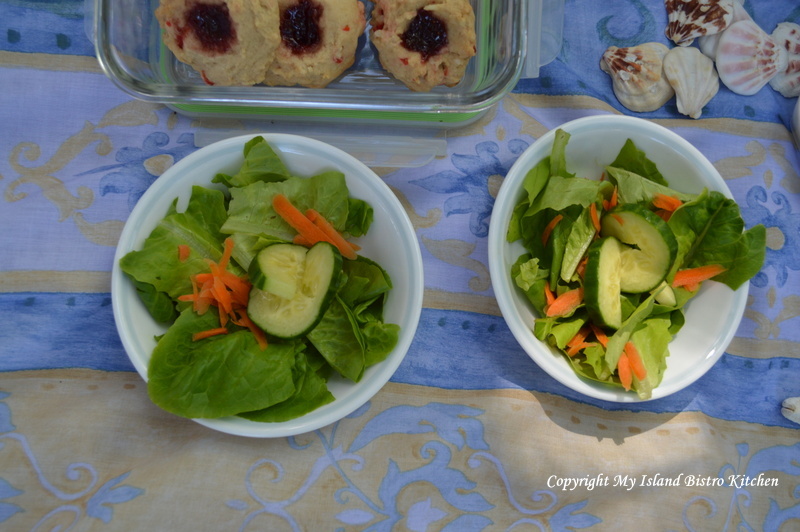 We eat a lot of salads and there is nothing better than running to the garden right before meal time and gathering a medley of fresh lettuce as well as some herbs from our little herb garden. 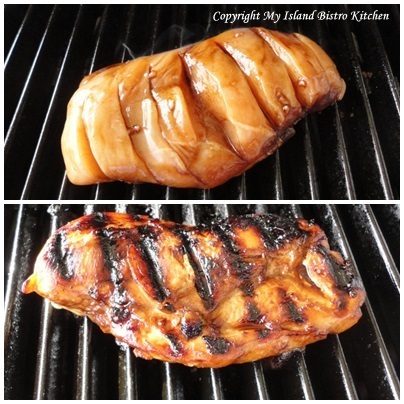 Slice the warm grilled chicken breast horizontally into slices about ¼” thick. Cover the plate with a medley of greens. Transfer the cut-up chicken breast to centre of the plate on top of the lettuce bed. Slice up and add some fresh strawberries and red onion rings. Sprinkle with feta cheese and a few nuts such as cashews or sunflower seeds (or both!). Add a balsamic vinaigrette and voila, a tasty and light dinner. Serve with baguette slices and a refreshing glass of your favorite white wine. Here I have selected “flipflop”, a California Pinot Grigio which made a fine accompaniment to a summer salad. My recipe for the vinaigrette follows. Of course, you know the secret to a really good vinaigrette – the best quality of olive oil and balsamic vinegar you can find. Because we have a “Liquid Gold Tasting Bar & All Things Olive” store in Charlottetown, I buy their olive oil and vinegar products because they are superior and fresh quality. 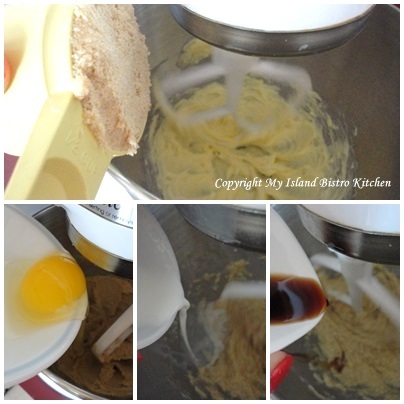 Mix and shake all ingredients together until well mixed. 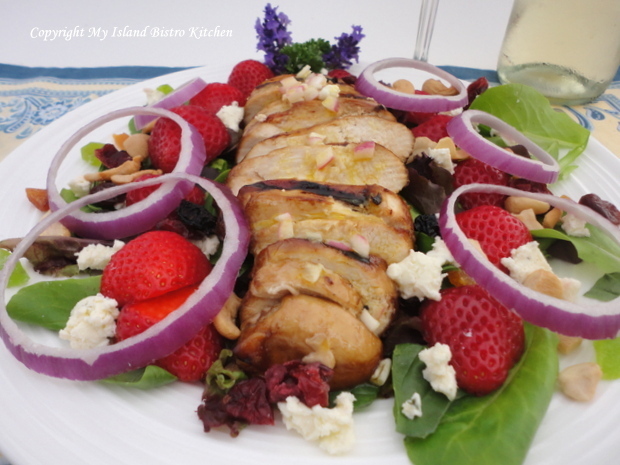 Drizzle over salad at time of serving. 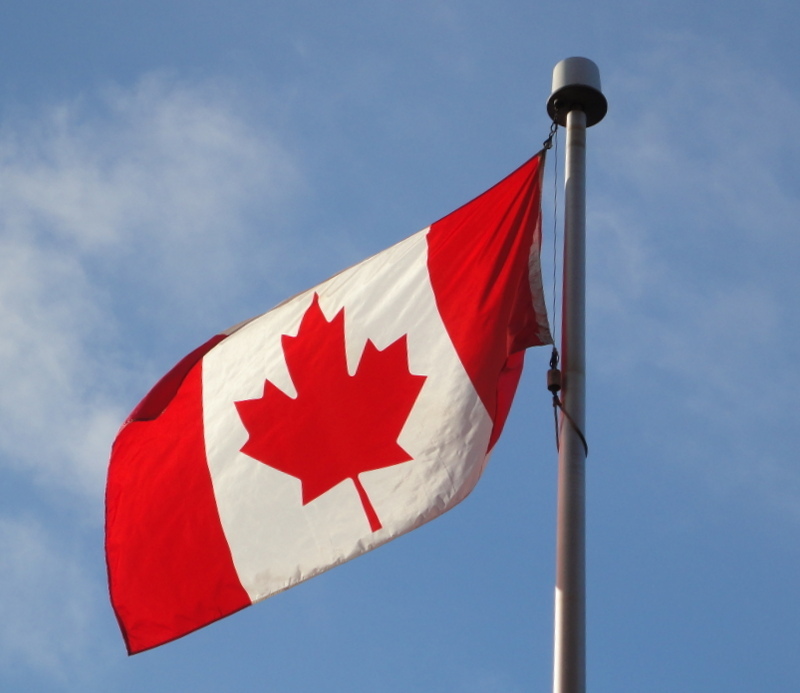 I am pleased to have been chosen yesterday as a featured food blogger by Food Bloggers of Canada. You can check it out by clicking here. Happy Christmas in July! I know, I know, I know! 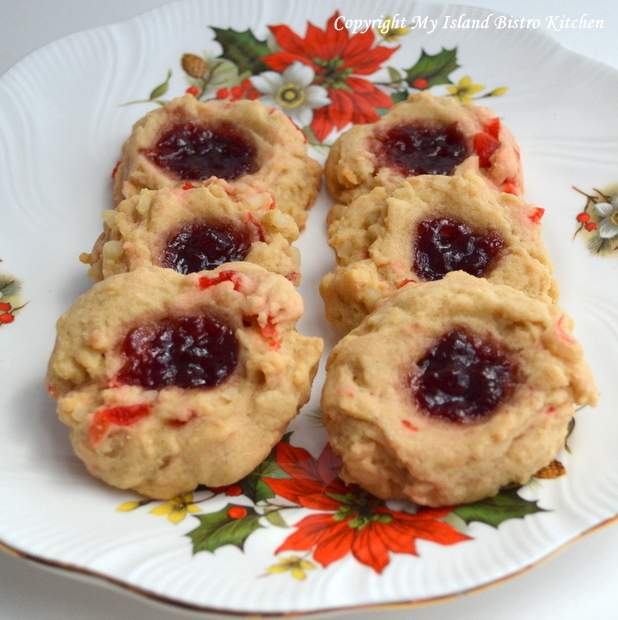 It’s only July but it’s never too early to think about Christmas cookies! 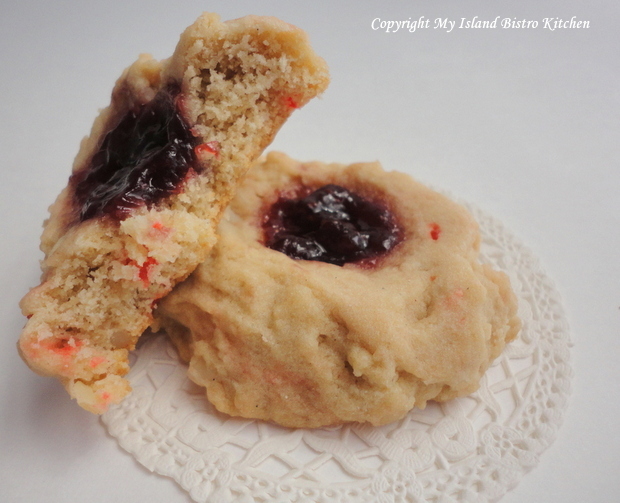 So, as I continue on with my Cookie of the Month series in 2013, I am sharing an old family favourite – Brown Sugar Jam-Filled Cookies – as the July cookie. This recipe was shared with me by a neighbour lady 36 years ago. 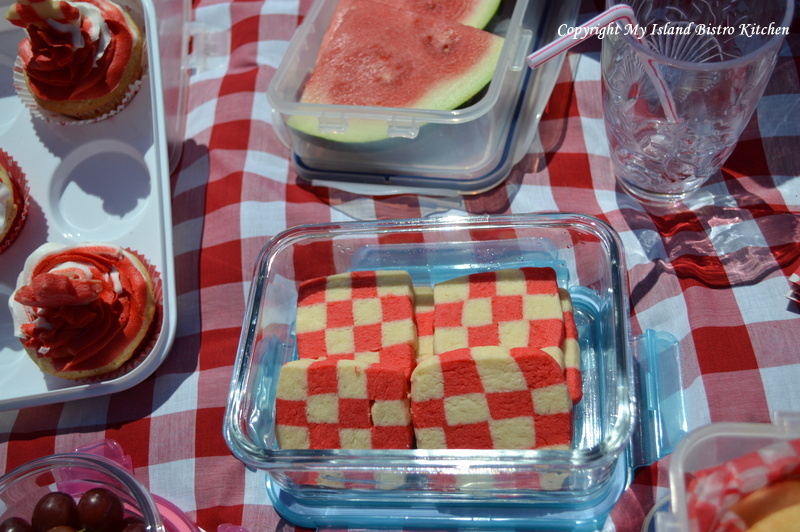 It has long been a favourite cookie in our household. 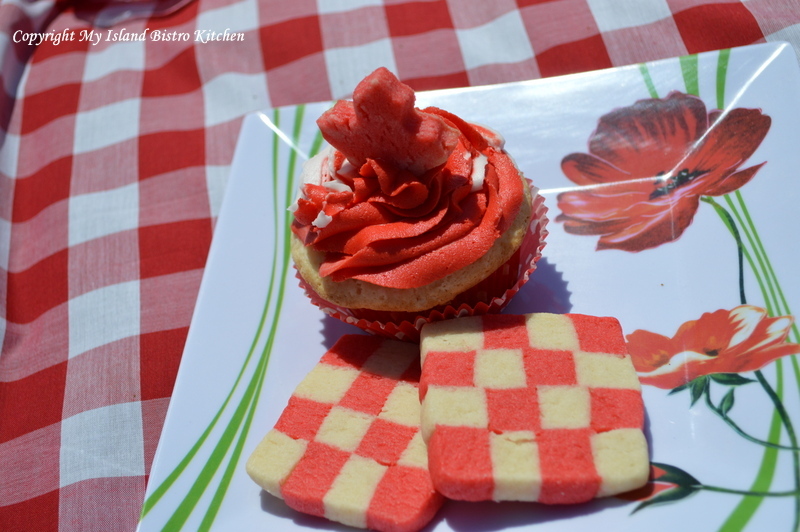 It is not too sweet but is very tasty….bite into one of these cookies and you’ll find that one will not be enough! You can also vary the flavour by using different jams and jellies in the center, although red jam is always the most showy. 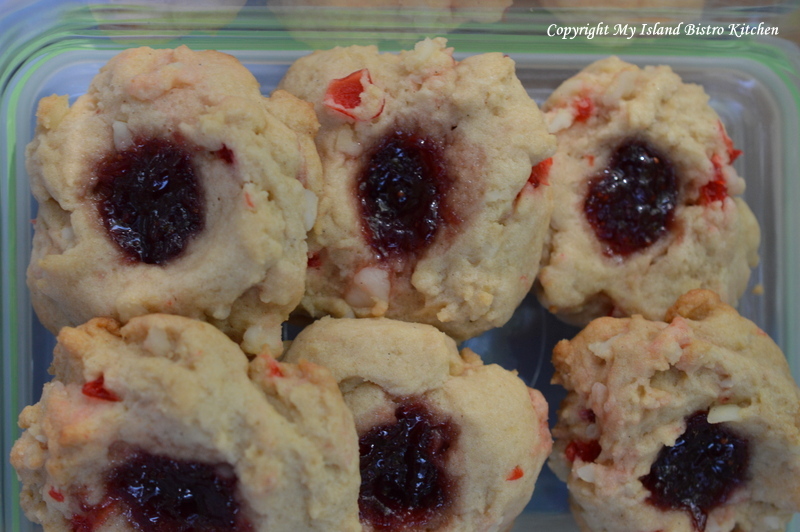 I have used some of my fresh batch of strawberry jam as the filler in the cookies in these photos. 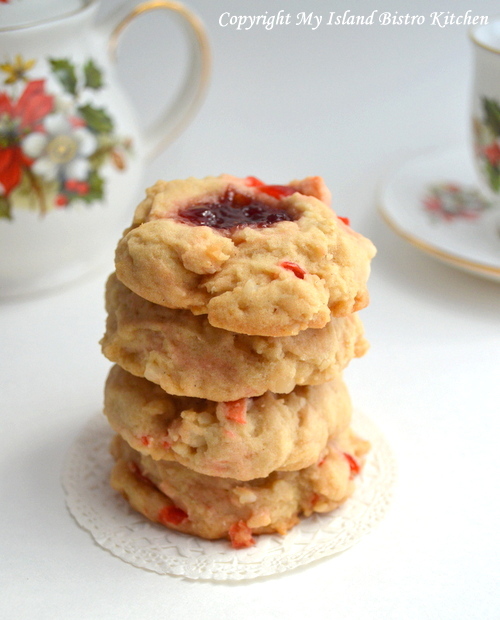 When my neighbour made the cookies, she never added cherries or nuts; however, I think these additions make the cookies a bit more special, particularly around holiday time. I do a lot of special baking around the holidays but have discovered that not everyone wants gooey squares and rich decadent cookies, balls, and candy that always seem to adorn sweet trays during the holiday season. For some, they are just too rich and sweet. These cookies are the perfect alternative. They are what I would class as a ‘substantial’ cookie yet the nuts and cherries still keep them within the Christmas ‘zone’. But don’t reserve them just for the holidays! 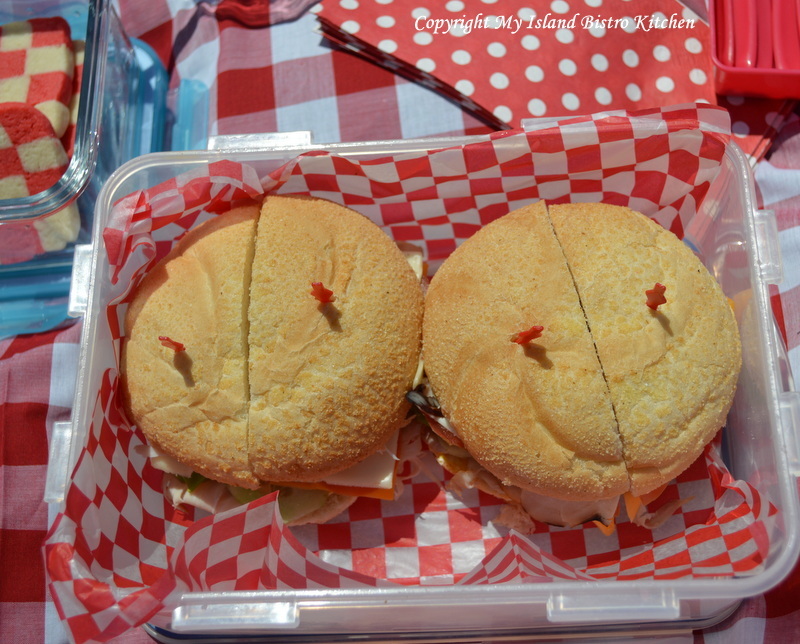 They are good any time of the year and are especially good picnic fare and lunch box treats. 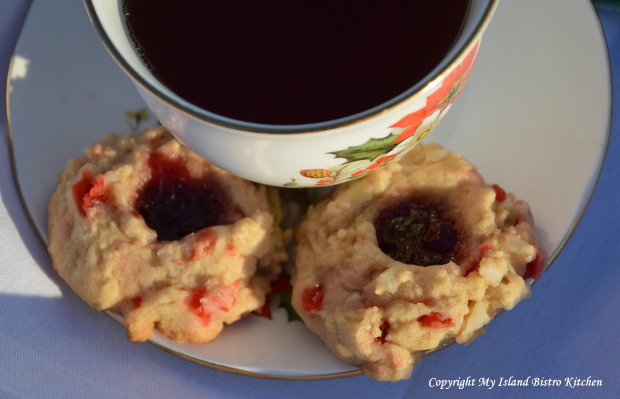 They also make a great tea-time snack (yes, I took my Christmas China to the beach for a mid-evening tea and had to watch out for the seagulls who were eying the cookies pretty well!). 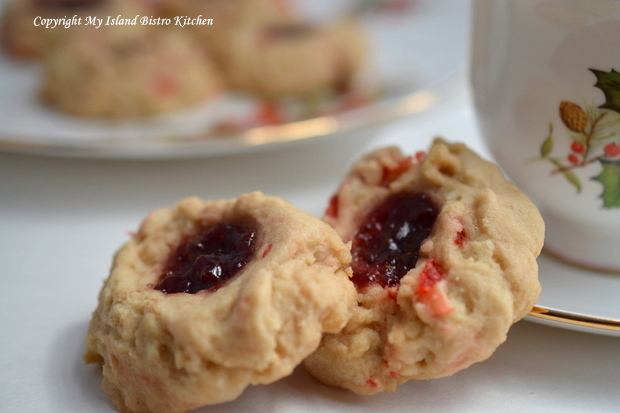 The Brown Sugar Jam-Filled Cookies are easy to make and don’t take uncommon ingredients. They also freeze well so are great to have on hand. 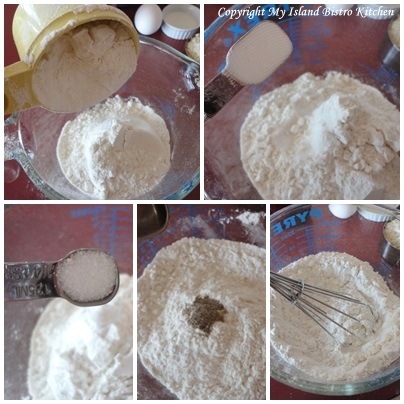 In medium-sized bowl, whisk together the flour, soda, salt, and cardamom. Set aside. Chop well-drained cherries. I drain them on, and dry them with, paper towel. 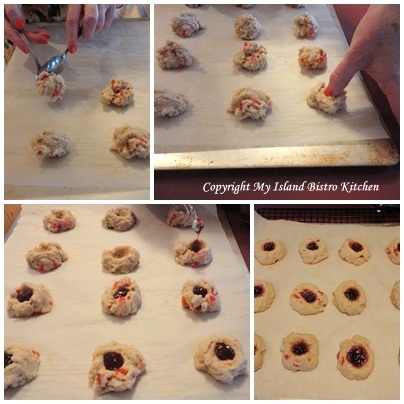 The cherries need to be very well-drained and dried as, otherwise, they will color the dough pink. Chop macadamia nuts. Set both the cherries and nuts aside. 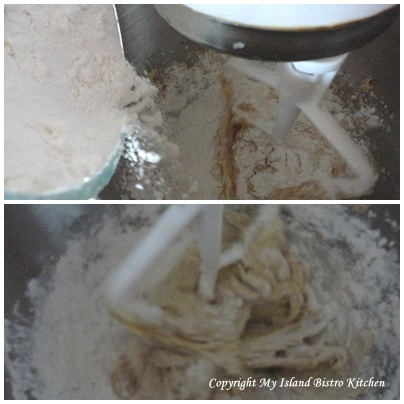 In bowl of stand mixer, cream butter and brown sugar until light and fluffy. Beat in egg, milk, and vanilla. On slow “stir” speed, stir in dry ingredients just until combined. Do not overmix. Stir in cherries and nuts by hand. On parchment-lined baking sheet, drop dough by teaspoonfuls. 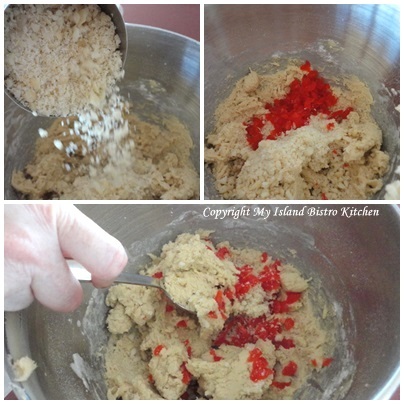 With thumb, press indent into center of each cookie. 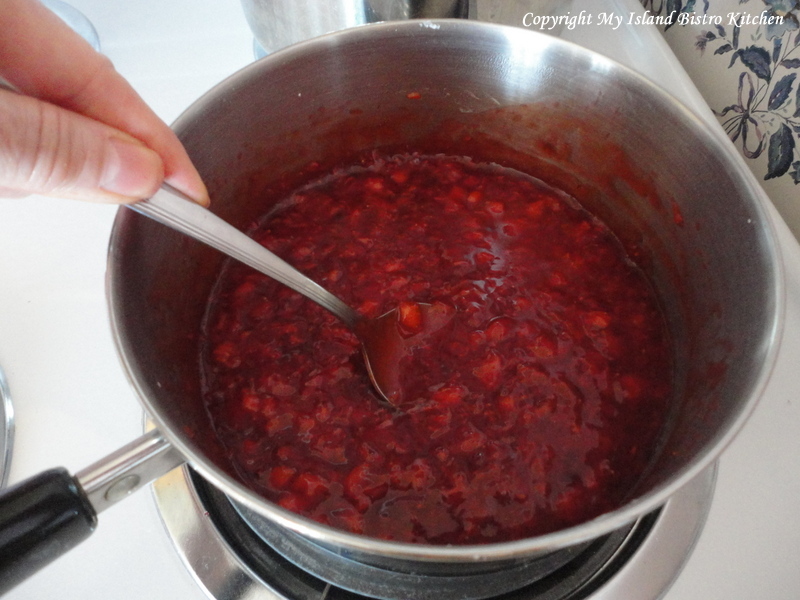 Fill with ¼ – ½ tsp of favorite jam or jelly. Bake for 12-14 minutes. Do not overbake. Let cool on baking sheet for 2 minutes then transfer to wire rack to finish cooling. Ever heard of the expression “the best laid plans of mice and men often go astray”? Well, that was somewhat my case today. 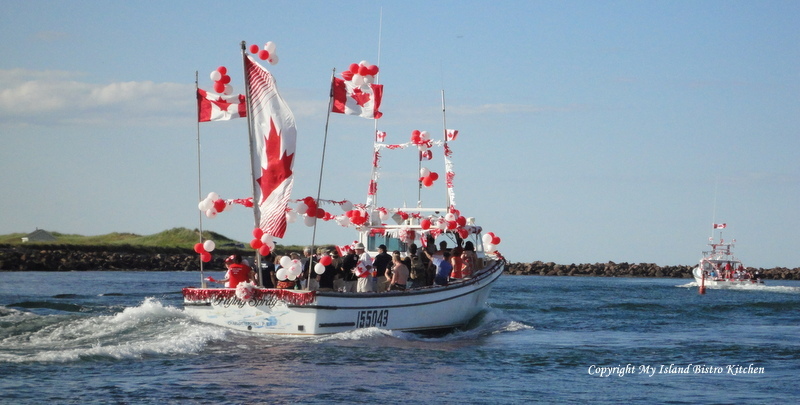 It’s been a hot, dry summer so far on PEI, and today was forecast to be 31C and very humid. 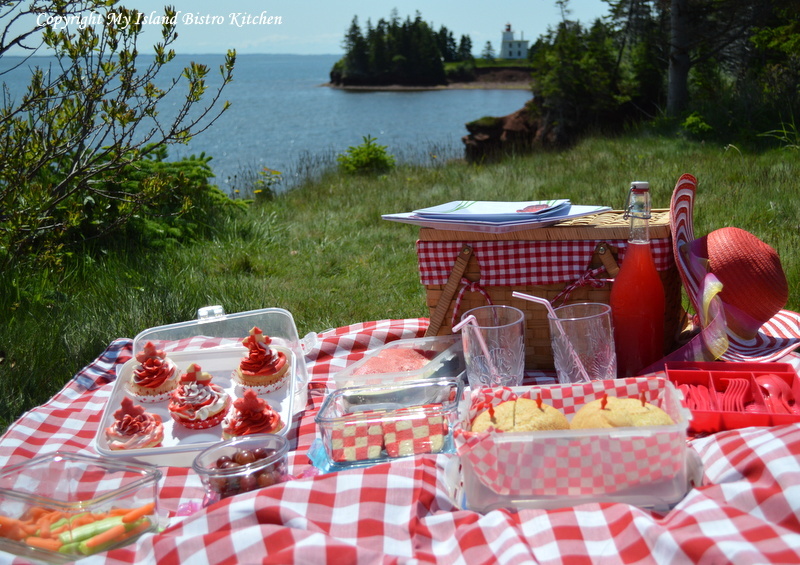 I had been planning a beach picnic for some time and last evening rolled out the plans for the day and began preparations. 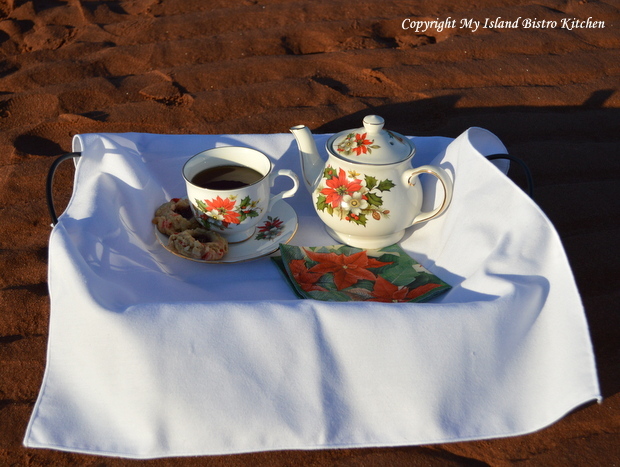 This morning, while it seemed a little breezy, I didn’t think it was particularly windy so off we set for a mid-day picnic on the beach. However, when we arrived at our destination, the whitecaps were rolling in to shore at a reasonably good clip. Suffice it to say it was breezy and it was going to be difficult (read ‘impossible’ and ‘frustrating’) to hold things in place for a picnic on the beach. 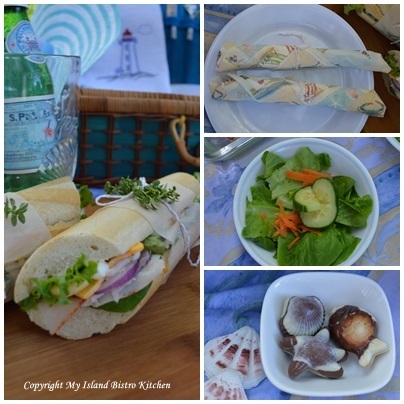 So, I had a “Plan B” ready just in case, for some reason, a beach location would not be suitable – good thing to do when the food has all been prepared! 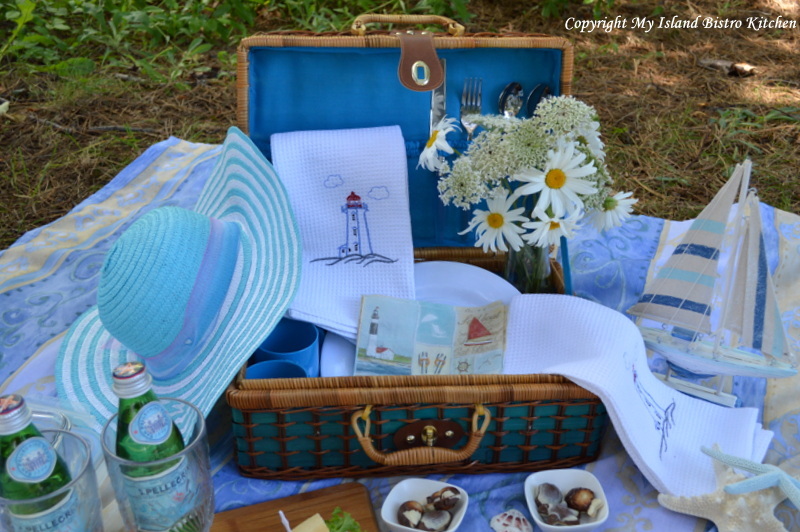 So, my beach picnic became a beach-“themed” picnic in a calm location not many yards from the beach where we could still hear the waves rolling in to shore. 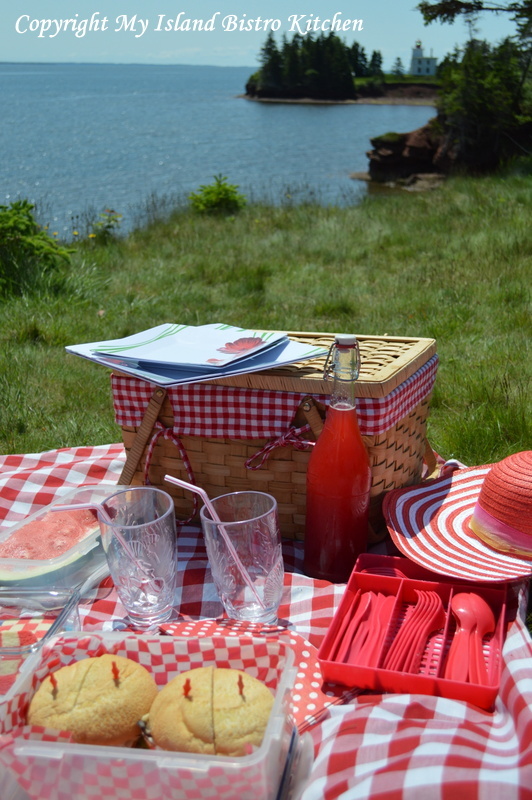 So, let’s assemble the elements of the picnic and see what is in the picnic basket. I like to wrap the cutlery in napkins. 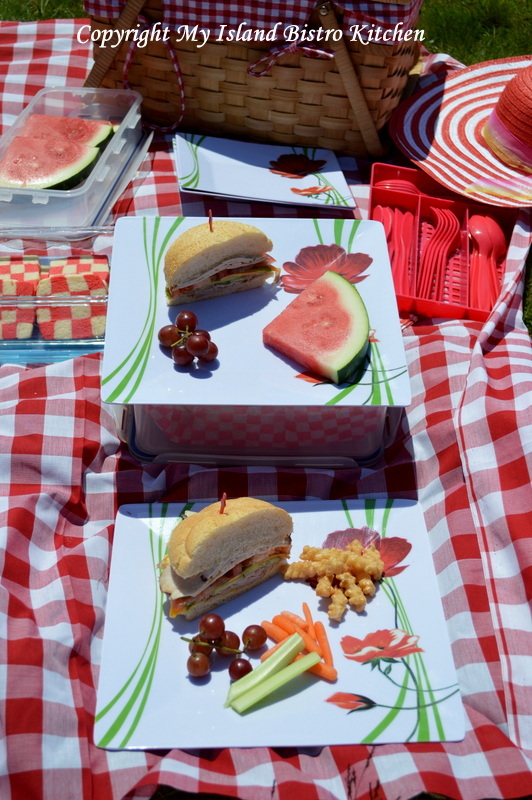 This can be done ahead of time and it’s also a great way to remember to bring along the napkins! 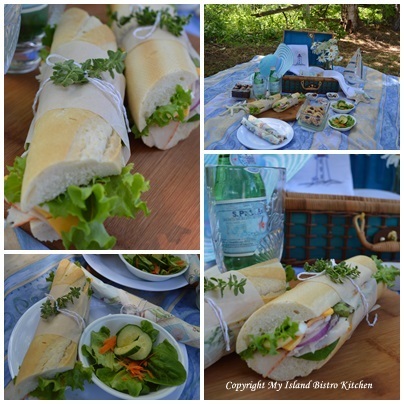 The highlight of today’s picnic were the baguettes – they were really tasty and very filling! 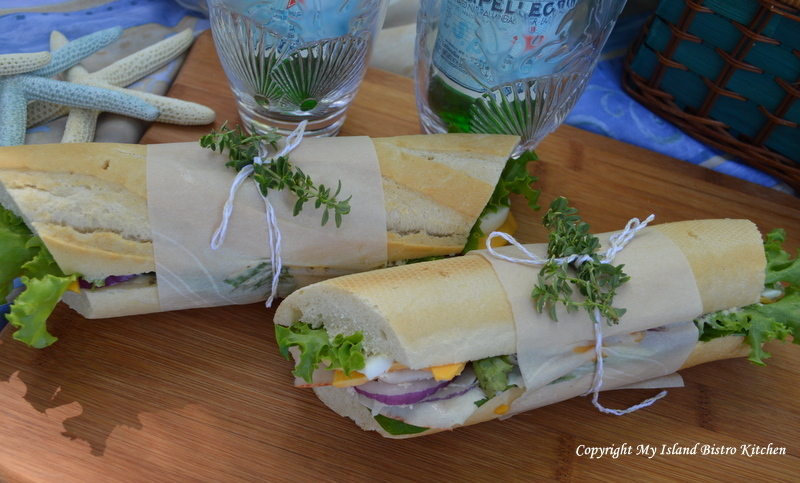 These looked extra special wrapped in parchment paper and dressed with a string bow and a sprig of lemon thyme from my herb garden. 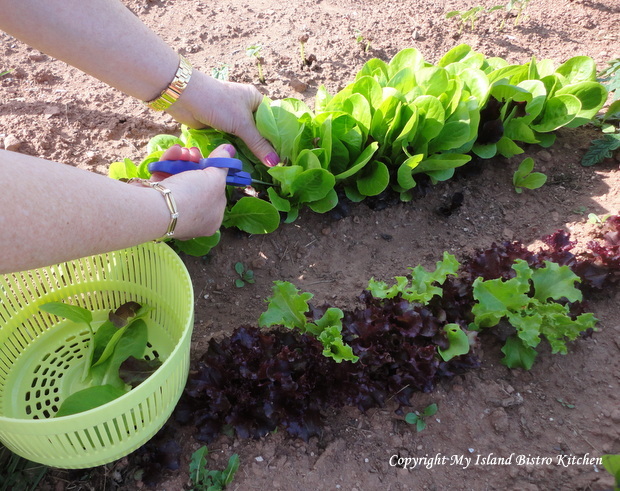 We have lots of fresh leafy lettuce in the garden these days and salads always taste better with produce freshly picked. It doesn’t get any more local than the backyard garden! 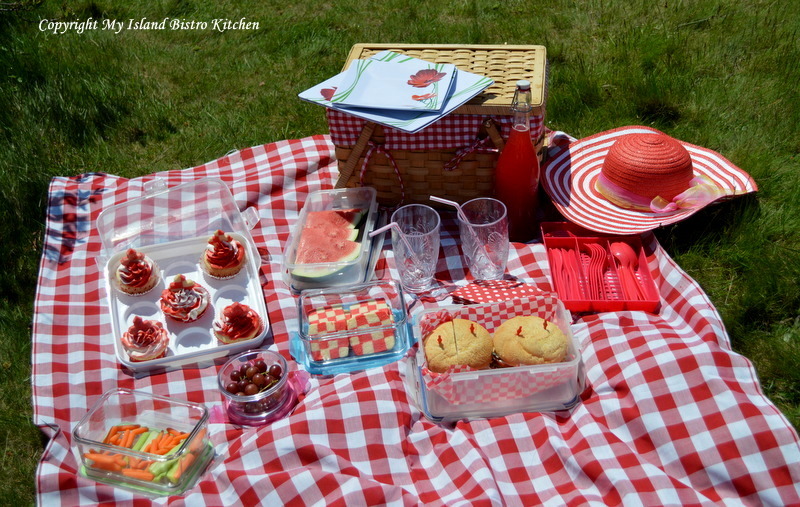 Food always seems to taste so much better outside and there is no reason why a picnic can’t be as stylish as a table setting. 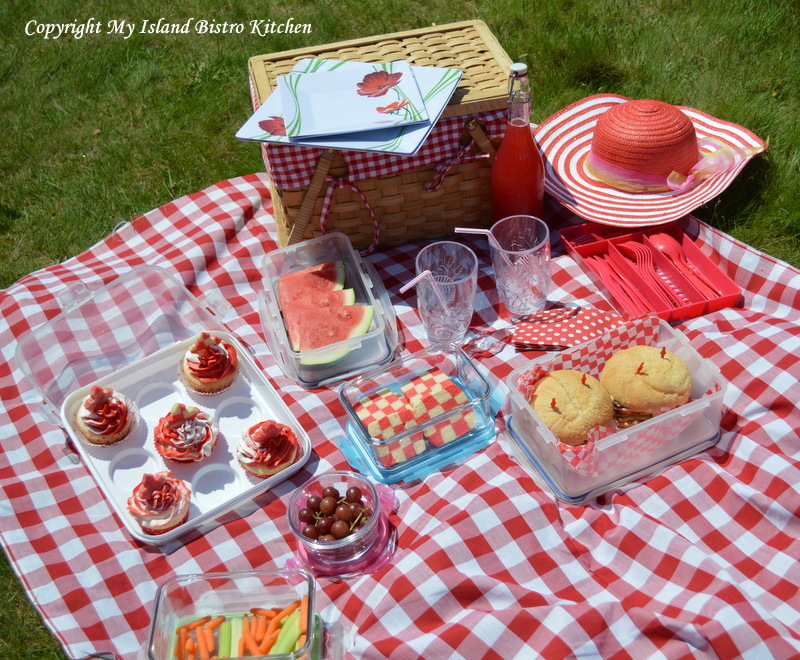 All you need is a pretty tablecloth, a posy of wild flowers, a few props, some tasty food and you have an instant picnicscape. 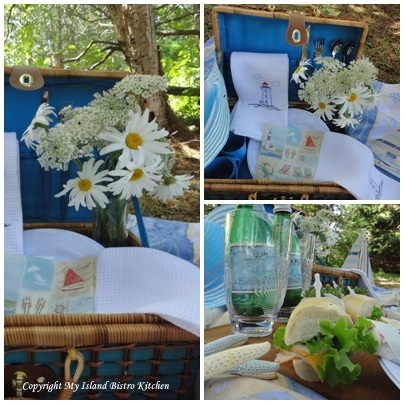 I live near water so a lot of my inspiration for tablescapes and picnics comes from the sea. A tasty lunch! Are you hungry yet? 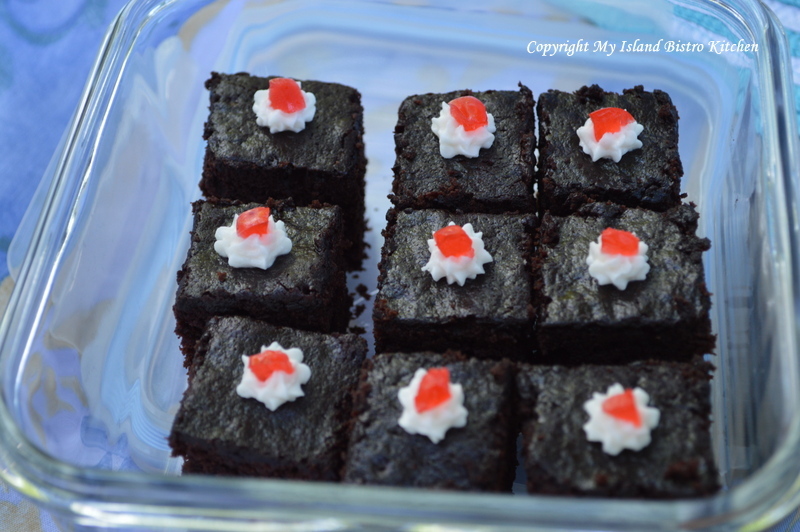 Brownies are the quintessential picnic food! 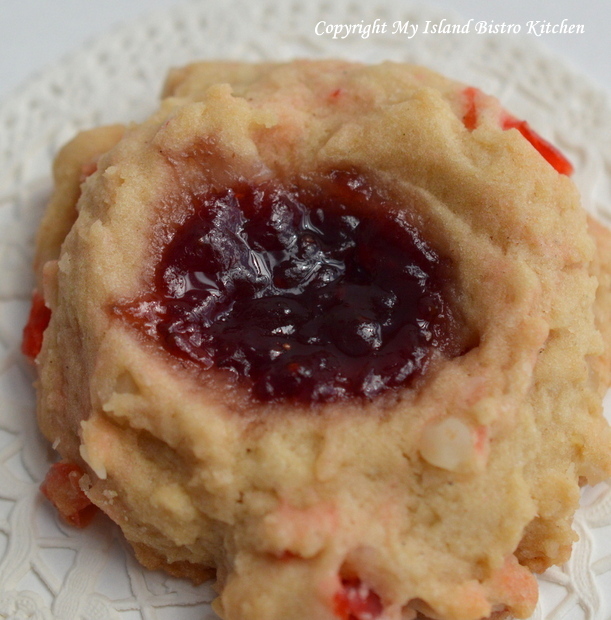 But Brown Sugar Jam-filled Cookies are good too! 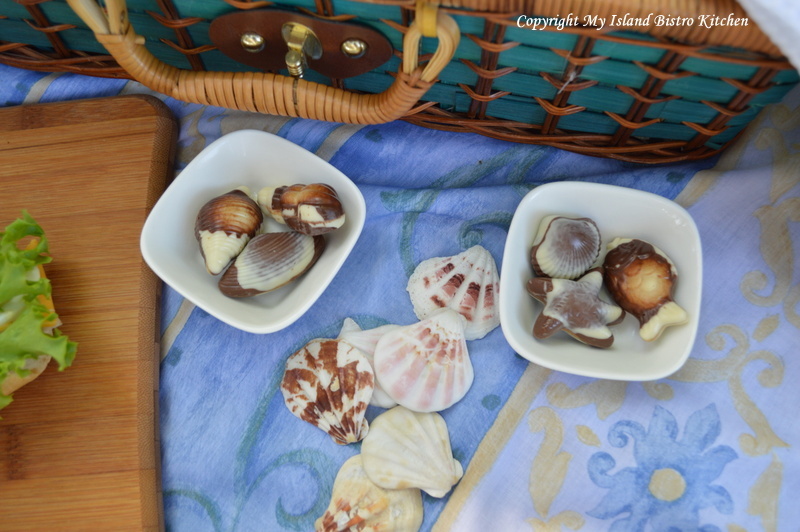 And sea-inspired chocolates are a great way to finish off the picnic! 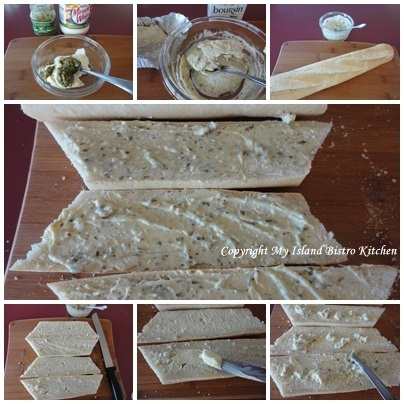 Cut baguette in two or three pieces, depending on length of baguette. 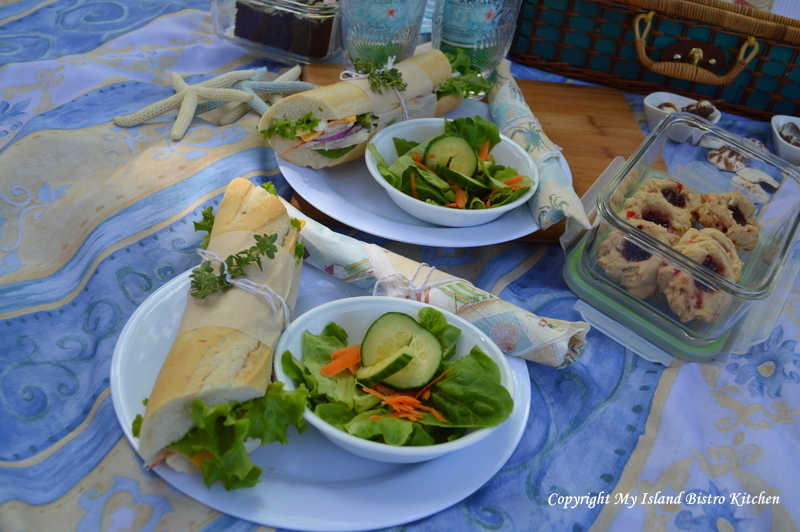 Slice baguette pieces in half, lengthwise. Butter both sides of the sliced baguette pieces. Mix mayonnaise, pesto, and goat cheese. Spread on both sides of baguette. 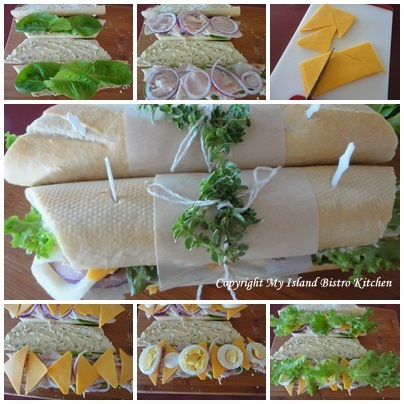 On one side of bread, add a layer of lettuce, followed by the shaved turkey breast, red onion, cheese slices, hard-boiled egg slices, and second layer of lettuce. Place second slice of bread on top. 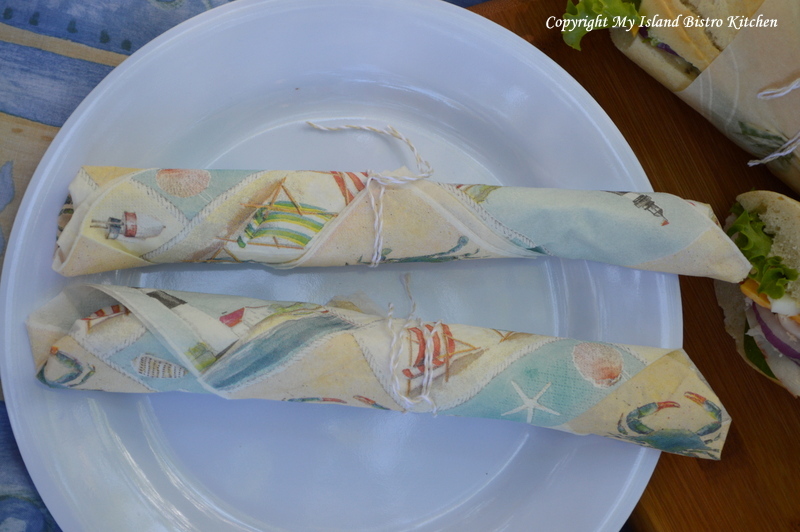 Wrap in parchment paper and tie with string. 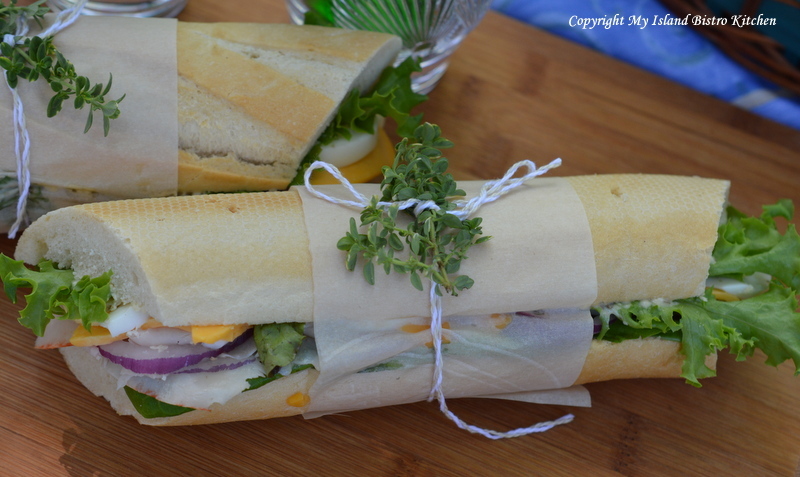 It may be necessary to use toothpicks to help hold the filled baguette together, particularly if you are going to be traveling a distance with them. 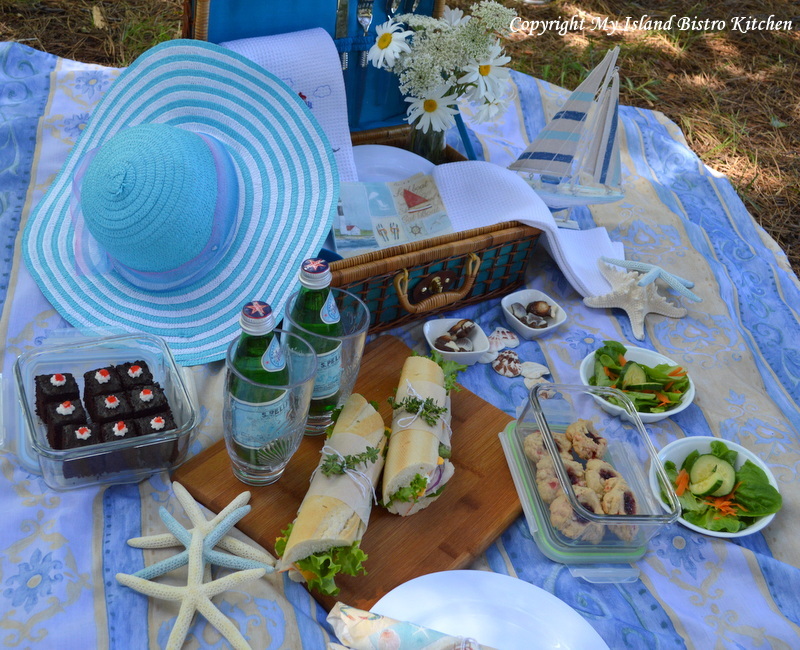 So, even if you live in a big city and dream of being near a beach or water, you can still have a beach-themed picnic inland wherever you are, as I have done here. 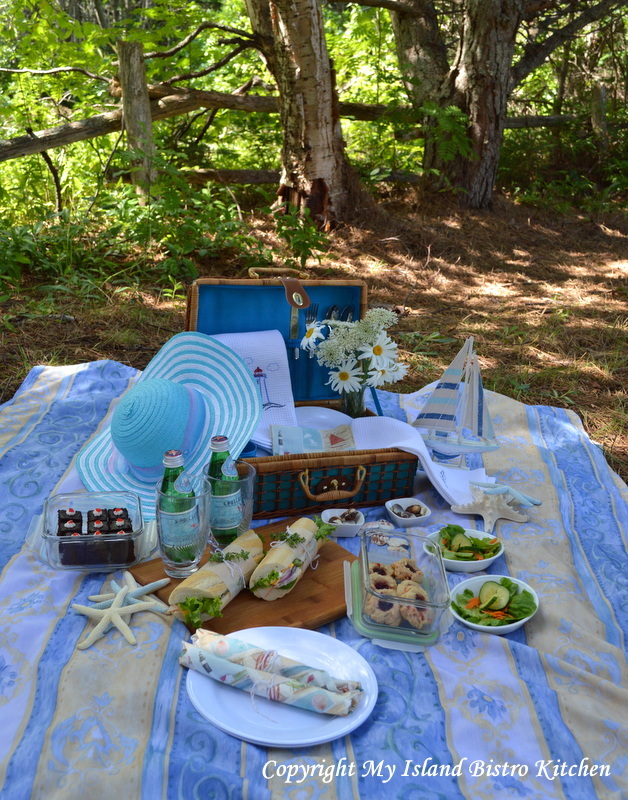 I hope you have enjoyed coming along on my picnic today. 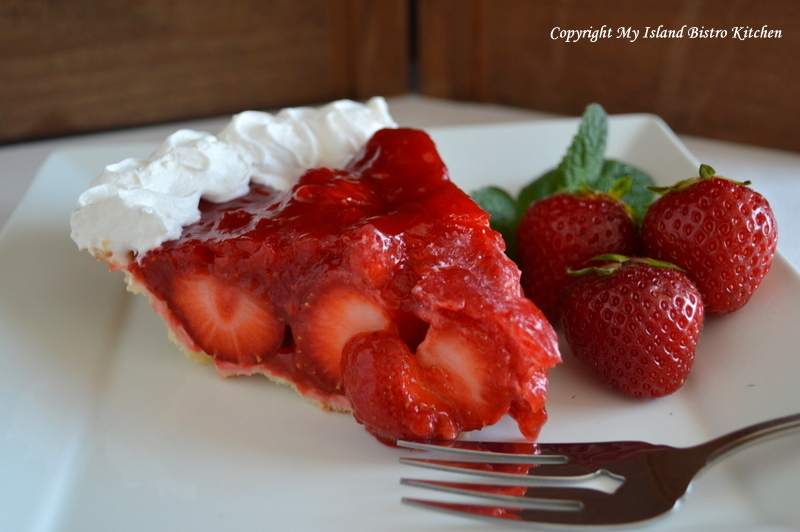 There are so many things I like about summer on Prince Edward Island but one of my very favorite things is glazed strawberry pie made with fresh, local Island berries. 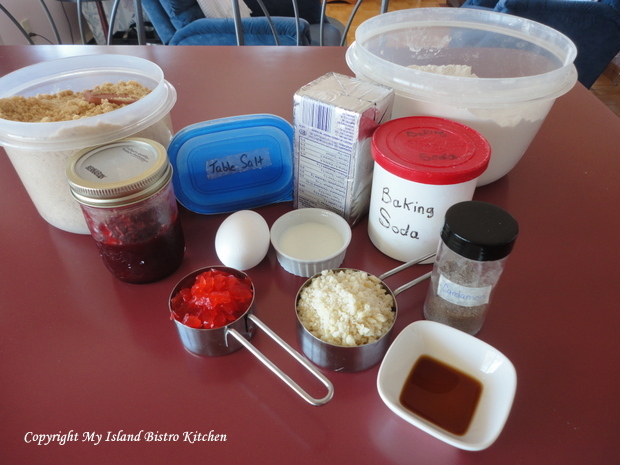 After I have had a couple of “feeds” of plain berries, sugar, and milk, I am ready for them in other recipes. 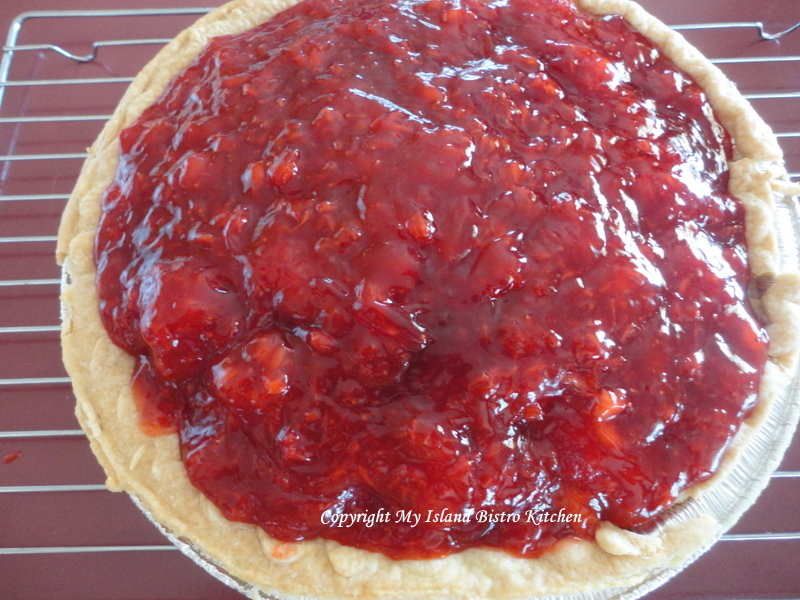 One of those recipes always has to be fresh strawberry pie. 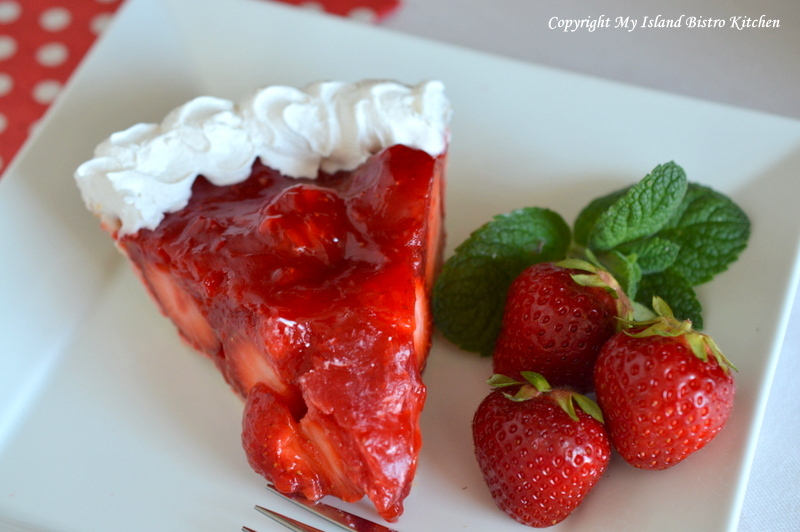 The strawberry pie recipe below is the one my family has used for at least the past 25+ years. 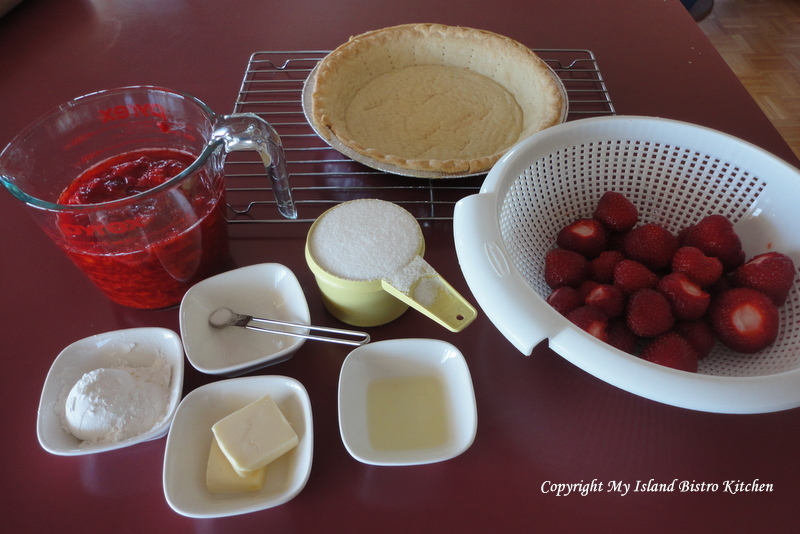 I have no idea what prompted us to start making strawberry pie or where the recipe came from. I just know it has been around for a good long time and I have yet to find any other that matches or beats it. 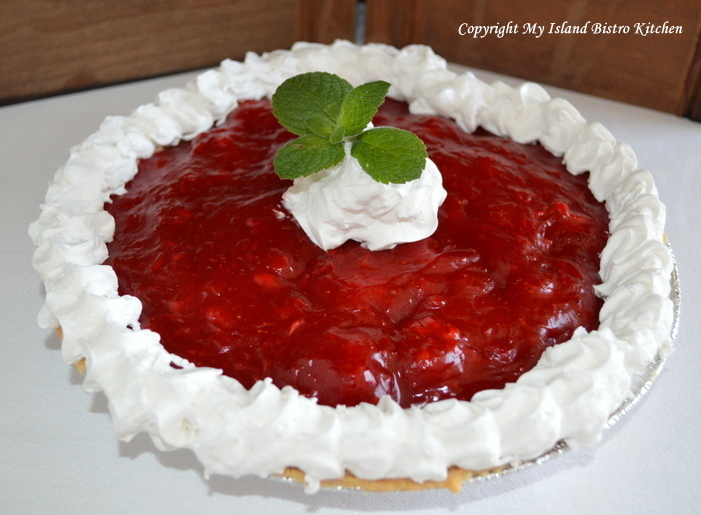 To make this pie, you will need the freshest strawberries possible and ones that are not overly ripe. A slightly firm variety of berry is best. 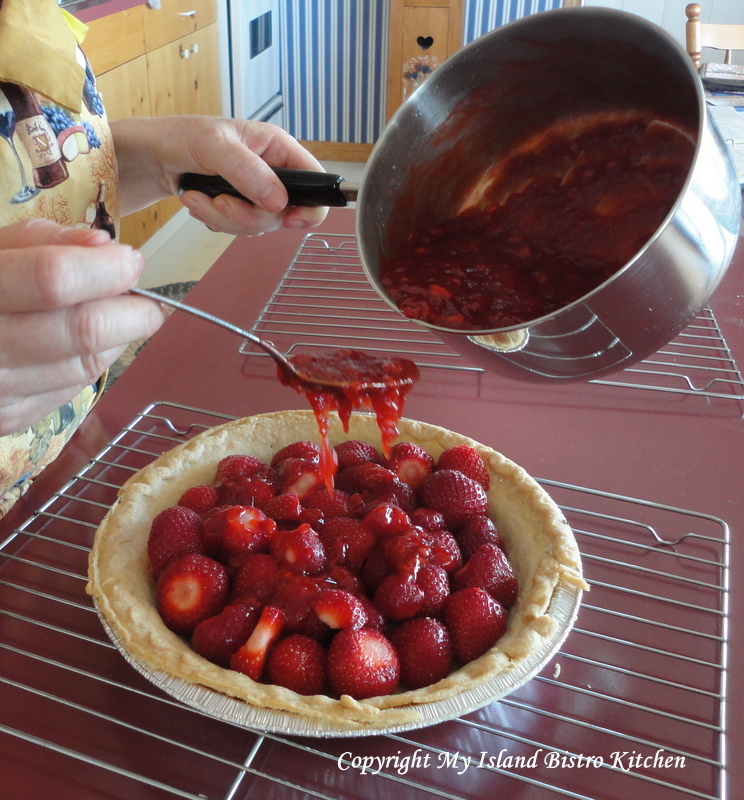 The berries I used in my pie came from Sarah and Ryan Schofield’s berry farm near Crapaud. 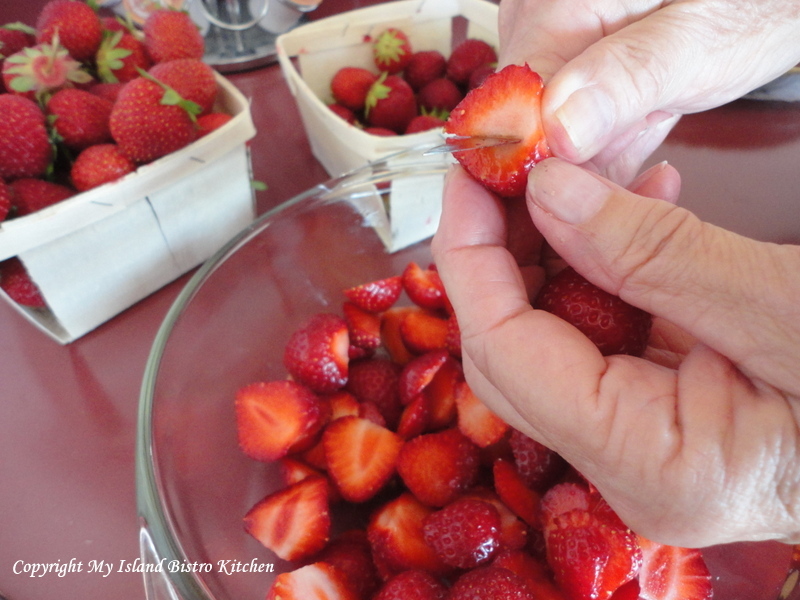 They sell their berries at Harvey’s Store in Crapaud Village and their boxes are nicely rounded up, just like we Islanders like to see – a good measure in each box! Normally, I like to make my own pie crust because I love to make pastry. However, with temperatures soaring well above the 30C mark the past several days, I decided I didn’t have the energy to make a batch of pastry so I opted for a frozen pie shell. 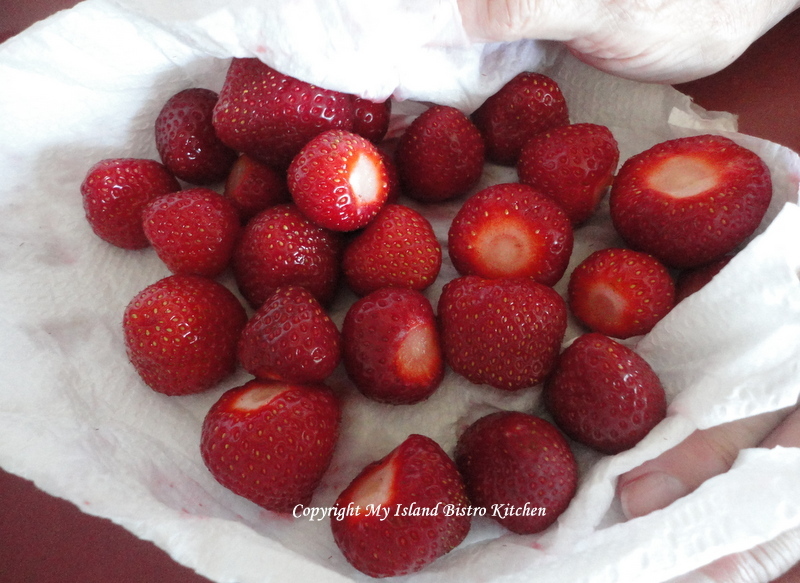 Hull, wash, and dry strawberries (use a paper towel to gently blot the berries dry). Set aside enough to cover the bottom of the pie crust. Cut up berries to prepare them for crushing – it’s hard to say exactly how many because berries vary in size and water content. Start with a few berries at a time. 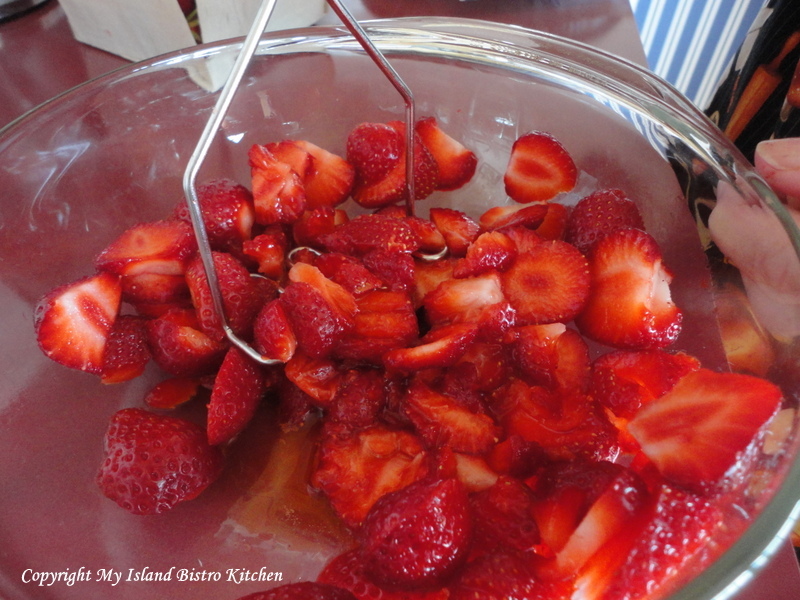 Using a potato masher, crush enough strawberries to make 1 1/2 cups. In medium-sized saucepan, combine cornstarch, sugar, and salt. Mix well. Add crushed berries and stir to blend well. Place mixture over medium heat and stir constantly until it becomes somewhat clear and it starts to thicken, about 5-7 minutes. Watch that mixture does not scorch as this can easily and quickly happen. Reduce heat to low, cover mixture, and continue to cook for 5 minutes, stirring occasionally to prevent mixture from sticking to pan. Remove from heat. Add butter and lemon juice. Stir well. 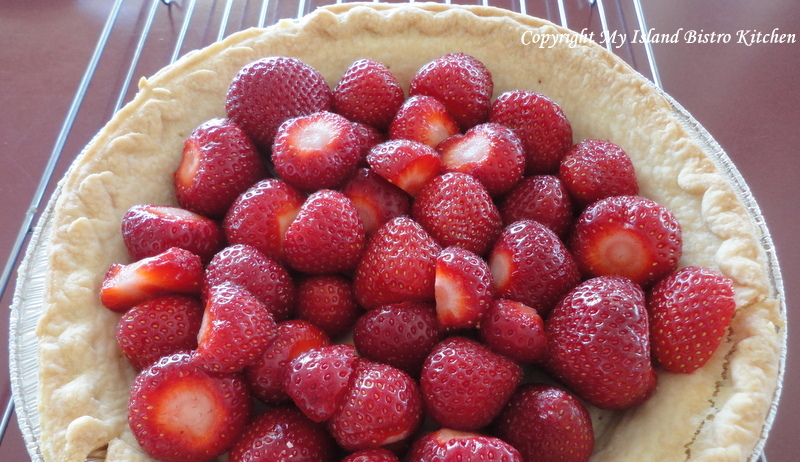 Arrange whole strawberries in baked pie shell. If necessary, fill in any gaps between berries with a few cut-up berries. 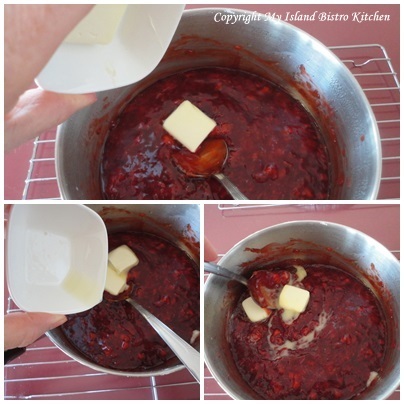 Spoon hot glaze mixture over the berries. 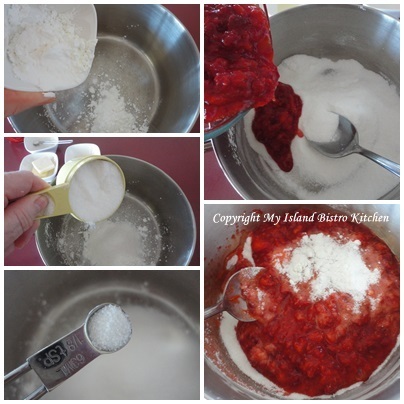 Completely cover berries with the glaze. Place pie in refrigerator and let chill several hours (at least 3 hrs) before serving. Add whipped cream at time of serving and decorate with additional berries as desired. Tips and Notes: This pie is best served the day it is made as the pie crust tends to become somewhat soggy the next day. Leaving the berries whole helps contain the amount of moisture that soaks into the pie crust as cutting the berries up releases their juices and lessens the lifespan of the pie crust. 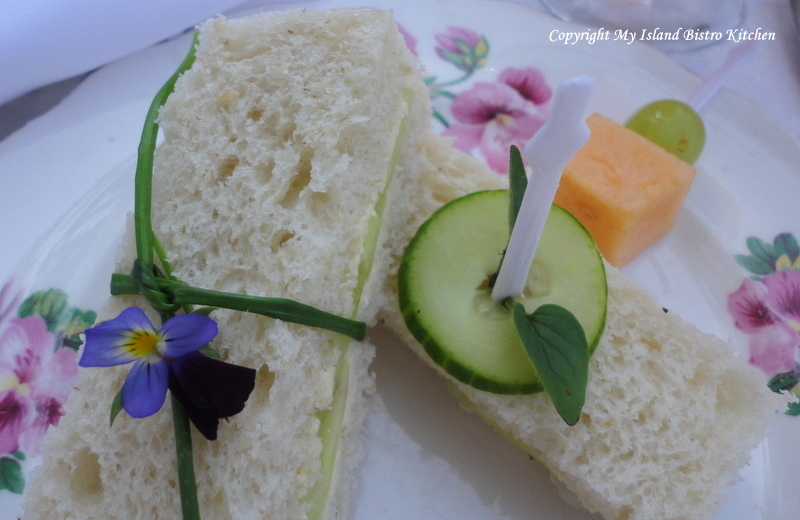 I love afternoon tea any time of the year. 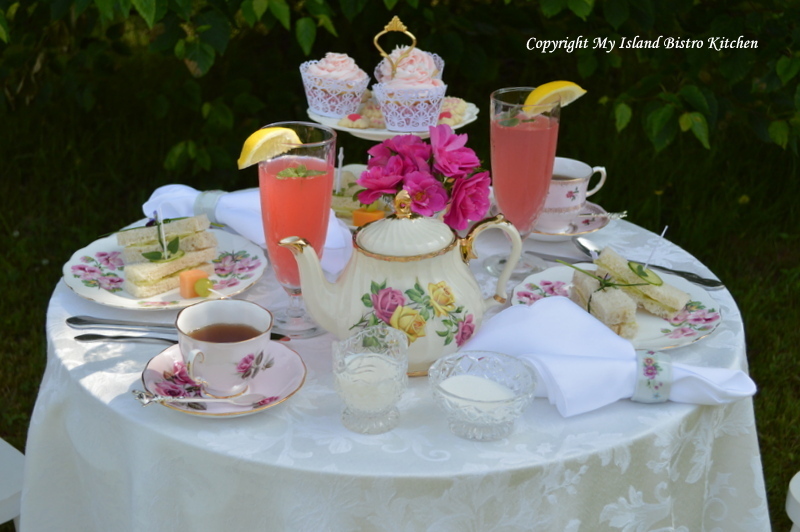 However, I especially like a good cup of tea, dainty sandwiches, and of course, a sweet or two, outside on a warm and calm day in the summer. 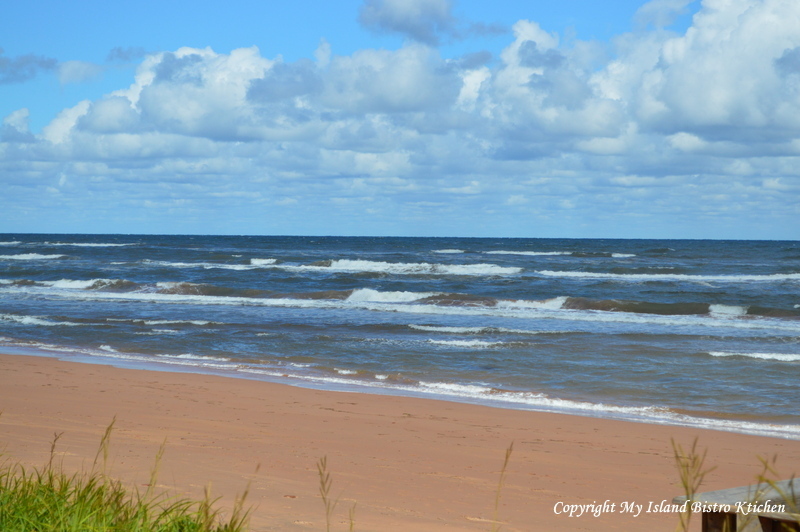 Here on PEI, where we are surrounded by water, it is hard to find a day where there is not a breeze blowing. However, last Saturday was such a day when the temperatures were soaring slightly past the 30C mark with hardly a breeze! 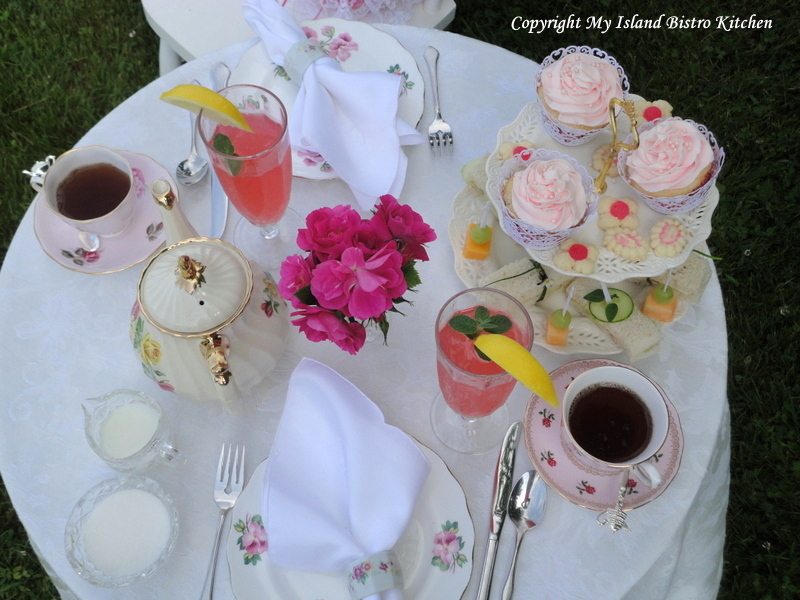 It was a good day for a summer tea under the shade of some big old trees. 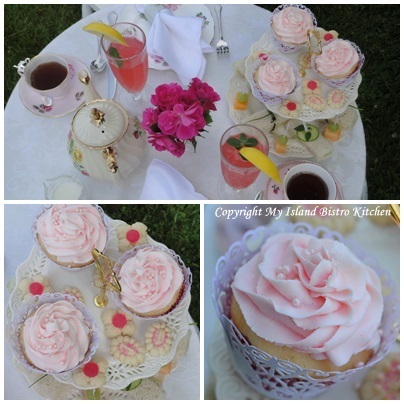 My inspiration for my teascapes comes from many sources, often from the season of the year, flowers in bloom, or a particular food item that I envision on a tea table. 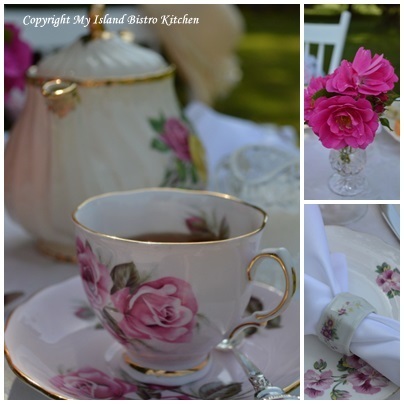 My Old Country Rose Tea was inspired by an old rose tree we planted at the back door of the cottage 20 years ago. 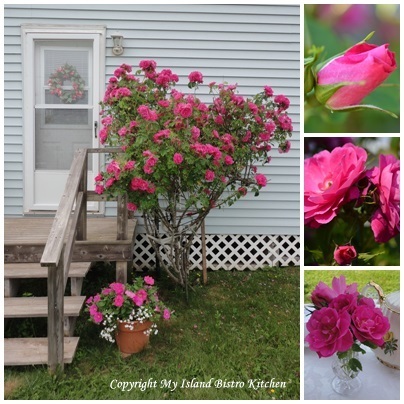 It blooms profusely and every year we think it may just break apart or stop blooming but each year, it produces a bountiful profusion of beautiful deep rose-colored roses. These roses are the kind that the blooms only last a day or two. Our Atlantic winters are not kind and, being so close to the Northumberland Strait, salt spray is also an element our trees, shrubs, and bushes must contend with. So, today’s teascape began with a small bouquet of roses from outside the back door. 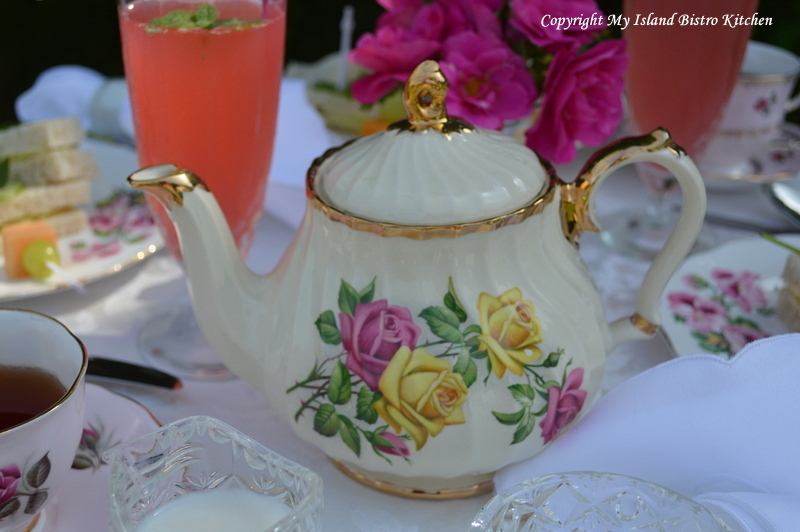 I looked through my collection of teapots to find one that would be suitable and selected this Sadler that seems very summery. 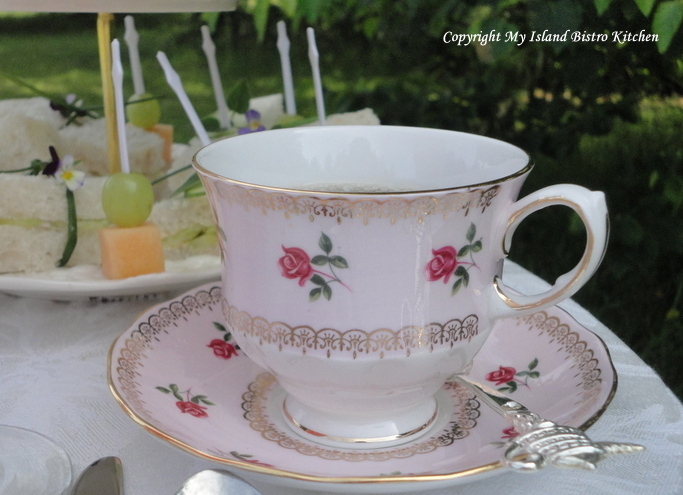 The teacups I chose featured roses as well. 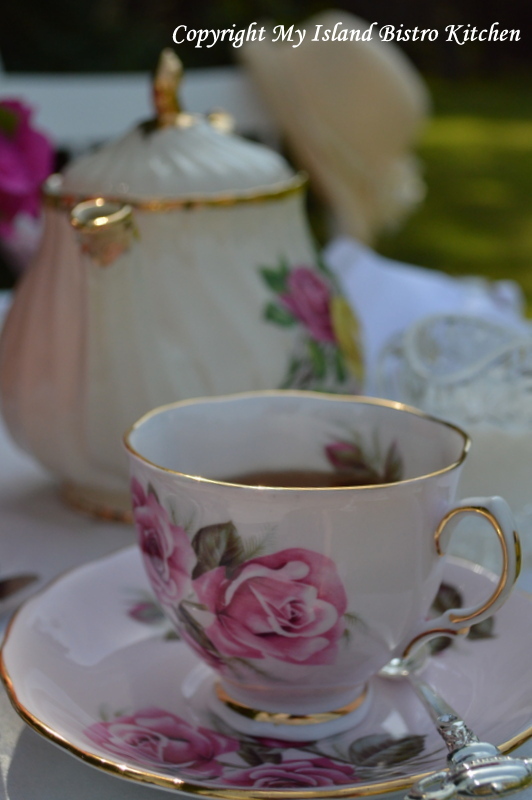 Why does tea always seem to taste better in a china cup and saucer? Teacups are too pretty not to be used. I look for ways and opportunities to use and enjoy them rather than storing them away. 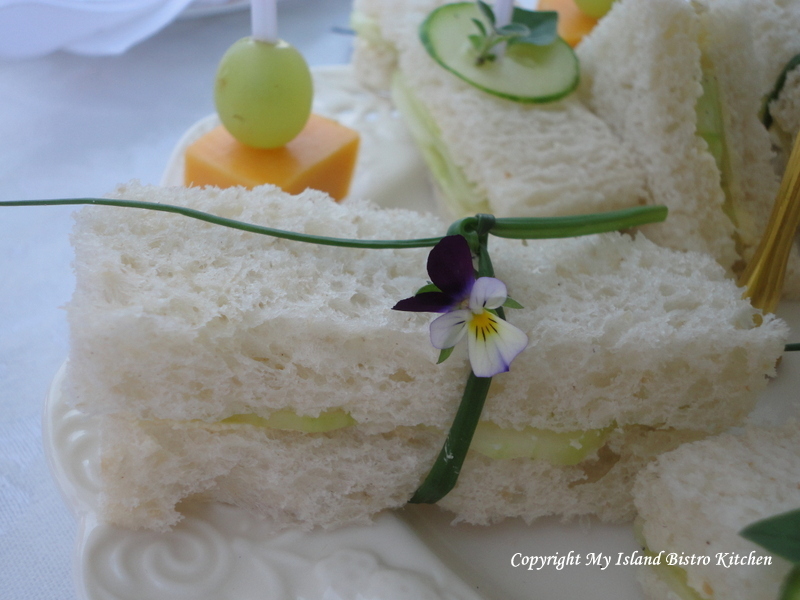 Because it was so hot, I chose to serve cool and refreshing cucumber sandwiches. 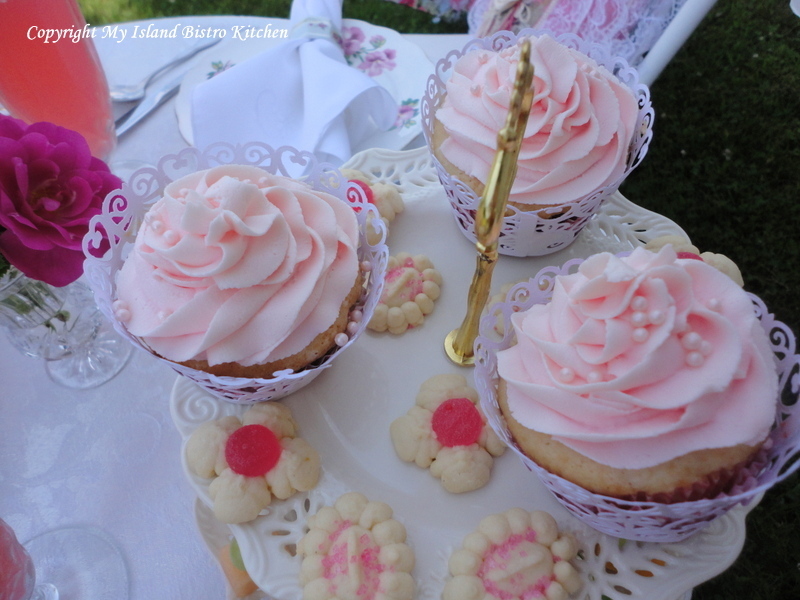 I love to decorate food with flowers….just make sure they are the edible kind! Add cubes of melon, cheese, and some grapes. 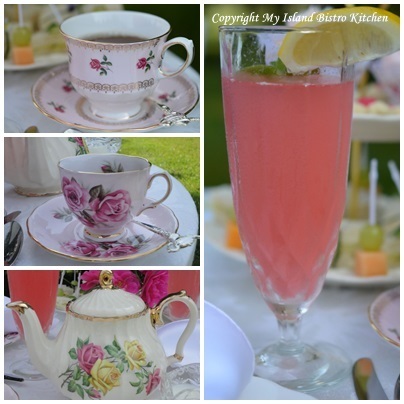 This year, I made several bottles of Rhubarb Cordial so served some of this refreshing drink as well as Assam tea. Naturally, there had to be something for the sweet tooth. 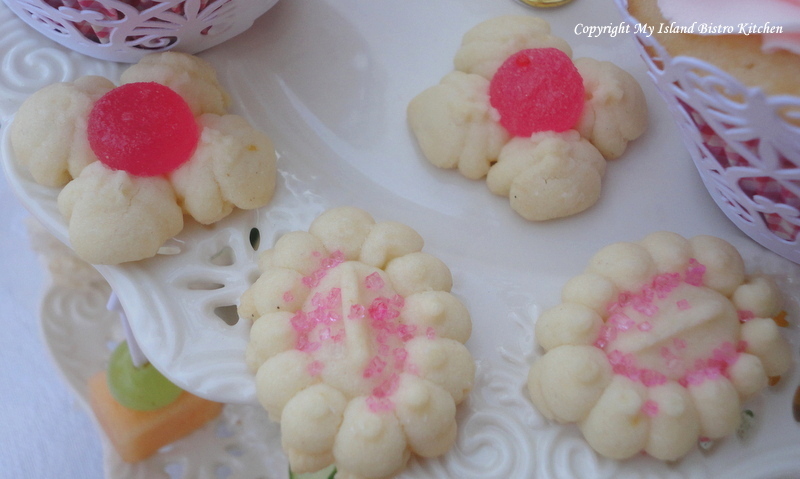 I made another batch of my Lemon Spritz Shortbread Cookies (my April 2013 “Cookie of the Month”) because they remind me so much of summer and are so light tasting. 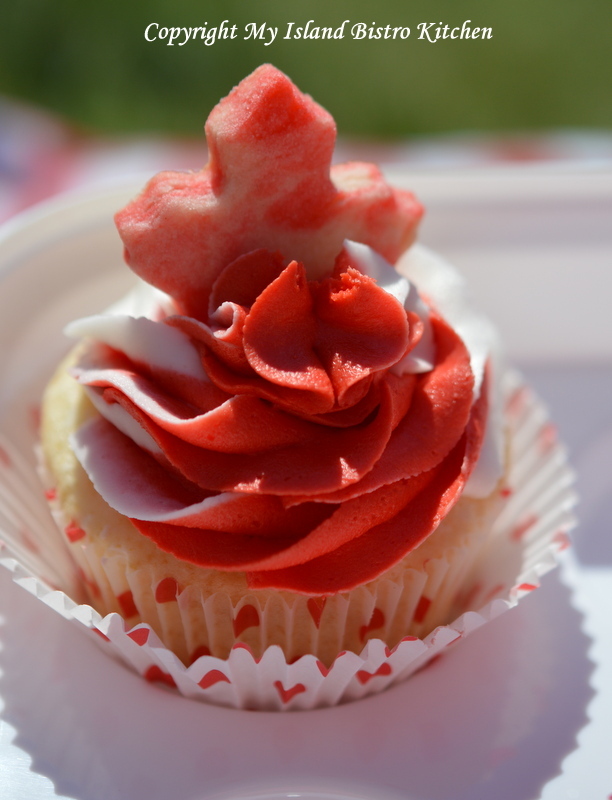 And, for the finale, vanilla cupcakes iced in rich buttercream icing. 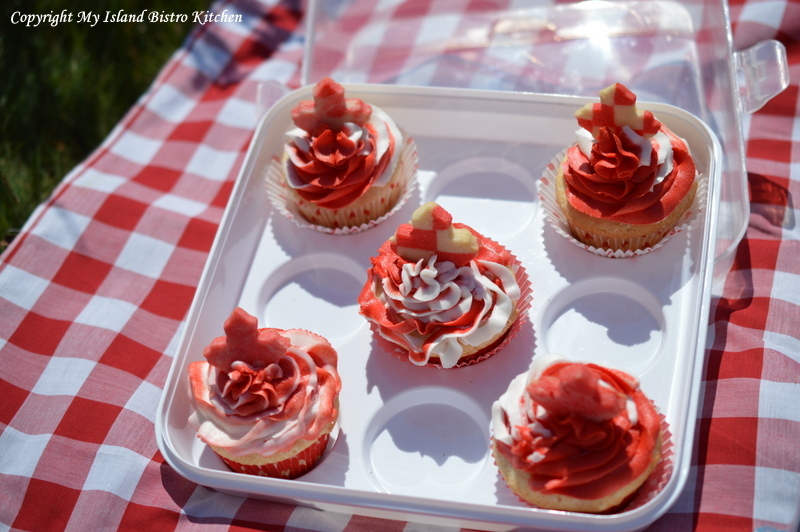 Cupcakes are a simple and more informal way to serve cake at an event. 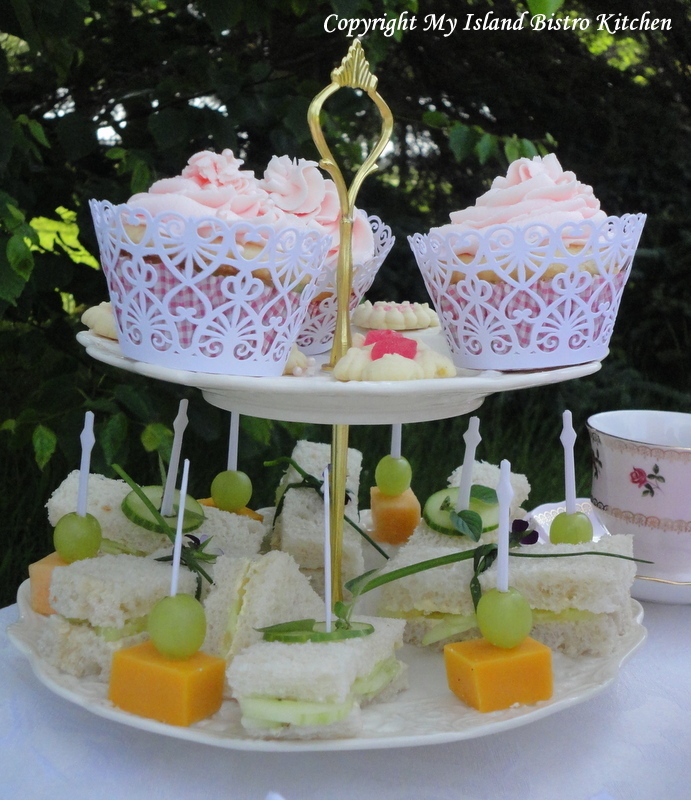 And, when it was all assembled, this is what the tiered tea tray looked like. 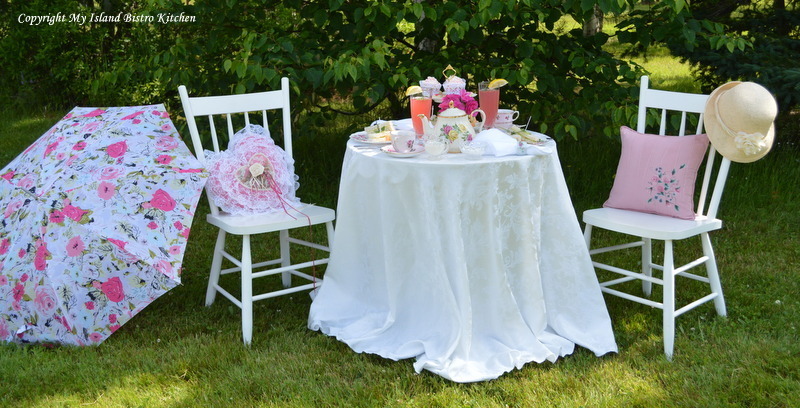 And, here is an overview of the tea table. 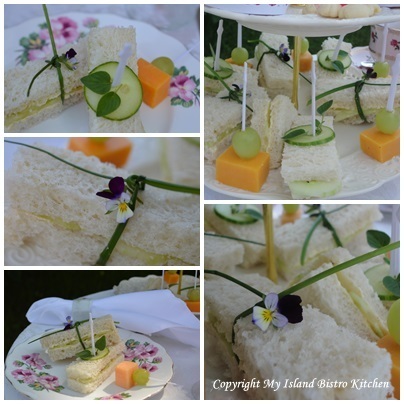 I hope you have enjoyed a glimpse into my early summer tea.